An essential part of any Oscar-themed Christmas party, holding your own company Oscars award ceremony is a great opportunity to bring added fun to the evening and celebrate some of the stars of your office. When it comes to choosing award categories, we’d recommend staying away from anything too serious – think less ‘Hardest Worker’ or ‘Best Punctuality’ and more about how to add a bit of excitement. Why not present your awards in real movie category style, but with a touch of humour. For example you could have the George Clooney award for best dressed male, or Diva of the Year for someone who requires red carpet treatment. Christmas parties are all about having some end of year fun, and awards like these can be a great way to create a relaxed social atmosphere and take everyone’s minds off work for the evening. Holding a prize draw is a quick and easy added extra for your party that anyone can get involved in – just purchase a ticket and keep your fingers crossed. Prize draws usually work best if there are a few prizes up for grabs so people have a higher chance of winning something, and the more enticing the prizes are the more people will enter. Don’t make the prizes too specialist, stick to things most people will get some enjoyment out of, such as an unlimited cinema pass, vouchers for online shopping or an iPad, perhaps with an annual subscription to Netflix included. Splashing out a little on prizes is a nice way to show gratitude to your employees and colleagues and reward people for their hard work throughout the year. Everyone loves a good quiz, and a bit of friendly competitiveness will keep things lively at your party. With the Oscars theme, it makes perfect sense to have a movie quiz, but not just a standard Q&A. Take advantage of the big screen and flash up images of past Oscar award winners for people to name, or show clips from Oscar award winning movies – guess the movie for one point and gain bonus points for naming the actors/actresses as well. You can have people play as individuals or in teams, and have some fun prizes for the winners. Hollywood souvenirs are relatively cheap to source and keep to the theme, such as a Hollywood star walk of fame plaque or a director’s chair. These can be personalised with the names of the winners, either on the night or at a later date to present to them back in the office. 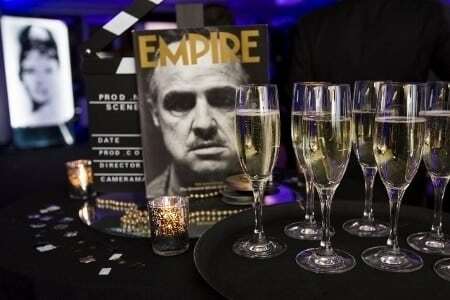 Click here for a list of hollywood theme items that can be purchased to add glitz and glamour to your party.